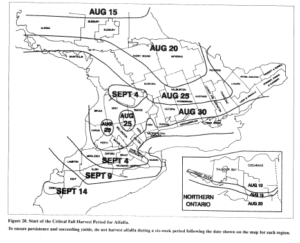 Many fields across Ontario may be at risk of alfalfa winter kill this year. This post contains links to OMAFRA resources that can help you determine whether your fields were at risk, if damage occurred, and what to consider for next steps. Due to rain delays, some fields were cut during the critical fall harvest period in 2017. To understand how cutting late can stress alfalfa and reduce winter survival, see Fall Cutting of Alfalfa. A cold snap in early January was broken with temperatures well above 0°C during the week of January 8th. This caused significant snow melt and water ponding in low areas. Cold conditions – more typical of January – returned suddenly. Another thaw event occurred on January 20, followed by freezing rain on the 22nd. Freeze-thaw cycles continued to the end of the month. Another thaw hit the province between February 14th – 28th. Temperatures dropped below freezing again in early March, but little snow cover remained in most of southern and central Ontario. Without the insulation of snow cover, exposed alfalfa is at a greater risk of suffering damage from cold conditions following the thaw. In ponded areas, ice will draw heat away from the plants’ crowns and can cause serious winter-kill. Frost Damaged Alfalfa describes the impacts of mild and severe cold injury. Freeze-thaw cycles can cause heaving, which push the crowns of alfalfa plants out of the ground, drying out the crowns or breaking tap roots. 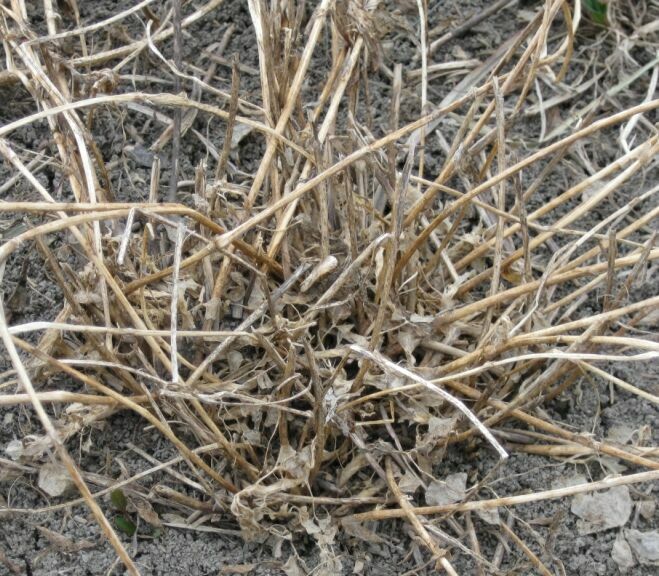 Frost Heaving of Alfalfa describes what to look for – clay soils, wet fields, and fields cut late are all at higher risk. Severe potato leafhopper damage was reported in central and eastern Ontario in 2017. These insects stressed plants throughout the growing season until killing frost. Stand age, variety, soil fertility, soil drainage, and the number of cuts taken can affect the likelihood of winter injury in alfalfa. A simple score sheet at the bottom of the Risk of Alfalfa Winterkill factsheet can help you assess the likelihood of winter kill on your fields. Does my field have winter injury? A stem count will indicate if the field has lost yield potential, but is not practical early in the spring before new shoots are 6″ (15 cm) tall. Plant counts give an idea of how well the stand has survived winter. 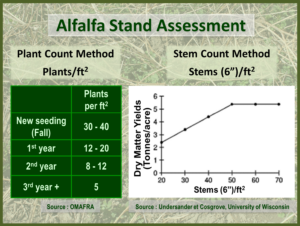 Guidance on stem and plant counts can be found in Alfalfa Stand Assessment, while Alfalfa Winter Injury outlines how to assess the health of alfalfa plants. Check Alfalfa Stands and Make a Plan includes pictures of what healthy alfalfa roots should look like. If you would prefer a video tutorial, Dr. Dan Undersander of the University of Wisconsin shows how to scout an alfalfa field in his video Alfalfa Stand Assessment: Is this stand good enough to keep? My field is damaged. Now what? If the alfalfa was established in 2017, it may be possible to re-establish the stand. Older alfalfa stands are autotoxic – their roots produce chemicals that prevent new alfalfa seedlings from establishing (see Alfalfa Autotoxicity). If the field was a mixed grass/alfalfa sward, you can treat it like a straight grass stand and provide some nitrogen fertilizer to improve yields. Injured pure alfalfa stands should be rotated into a different crop. Other forage species will not be affected by the autotoxicity, and non-legume crops (grasses, cereals, and corn) will benefit from the nitrogen credit. Acknowledgements: Joel Bagg, Scott Banks, and Gilles Quesnel for the photos and articles.